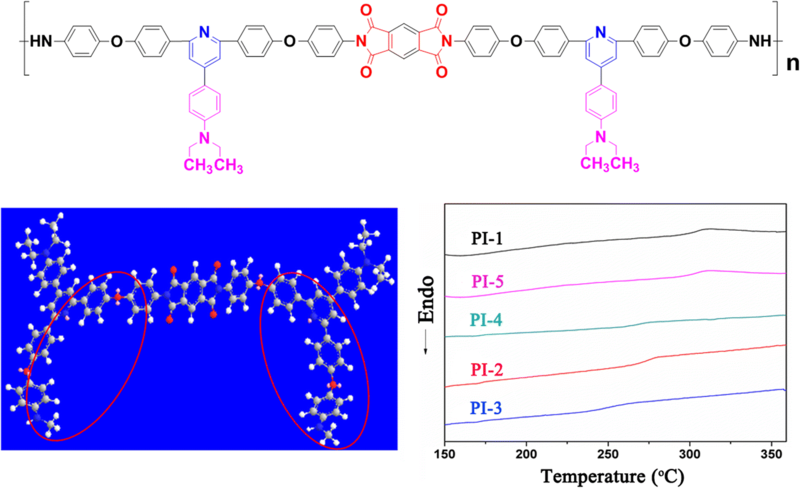 A novel aromatic diamine monomer, 4-(4-diethylamino)phenyl-2,6-bis(4-(4-aminophenoxy)phenyl)pyridine (EPAPP), containing pyridine ring units, ether linkage moieties and diethylaminophenyl pendent groups, has been designed and synthesized through three-step methods, and then used to prepare for a series of polyimides with commercial aromatic dianhydrides via two-step solution polycondensation. The resulting polyimides showed good solubility in common polar solvents, such as NMP, DMF, DMSO. They exhibited high thermal stability with the glass transition temperature (Tgs) more than 254 °C, and the temperature of 10% weight loss over 544 °C with more than 64% residue at 800 °C under nitrogen. They presented excellent hydrophobic properties with the contact angle in the range of 81.9–91.9°. In addition, the results of Wide-angle X-ray Diffraction (WAXD) indicated that these polymers revealed an amorphous structure. 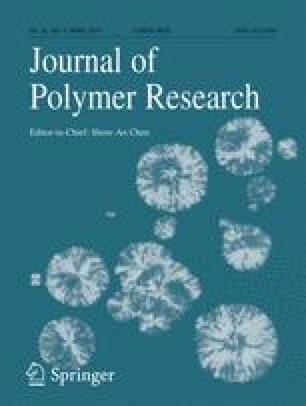 A series of containing pyridine ring and diethylaminophenyl polyimides were designed and synthesized from a novel diamine EPAPP with several aromatic dianhydrides. The online version of this article ( https://doi.org/10.1007/s10965-019-1759-8) contains supplementary material, which is available to authorized users. This work was financially supported by the National Natural Science Foundation of China (No. 51563005; 51605109), and supported by Opening Project of Guangxi Key Laboratory of Calcium Carbonate Resources Comprehensive Utilization (No. HZXYKFKT201806).